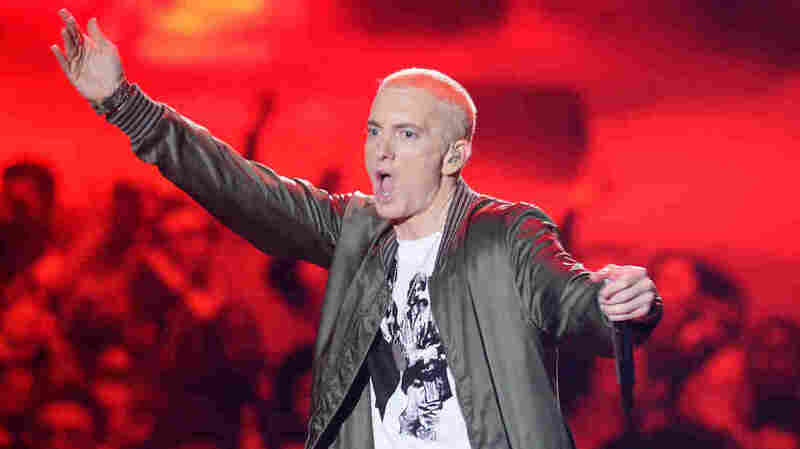 Eminem Wins Copyright Infringement Battle Against New Zealand National Party : The Record The New Zealand political party has been ordered to pay Eminem's publishing company nearly $500,000 in damages. Eminem onstage at the 2014 MTV Movie Awards. A version of the rapper's 2002 song "Lose Yourself" was used in a New Zealand ad campaign. New Zealand's National Party was forced to face the music today after being found guilty of infringing upon one of Eminem's classic tracks for a campaign ad. New Zealand's High Court issued its decision early Wednesday (Oct. 25), ordering the country's conservative National Party to pay Eight Mile Style, Eminem's publishing company, $600,000 NZ dollars (about $415,000 US dollars) in damages over the 2014 campaign spot, below, which used a copycat version of the rapper's song "Lose Yourself" without consent. The judges found that "Eminem Esque" was more than just a coincidental suffix; the composer of the track was said to have Eminem's song in front of him while penning it. The National Party's bill could have been steeper — in its decision, the court concluded that, since the party's actions were taken after receiving professional media advice, they were not acting in "flagrant disregard" of Eight Mile Style's rights and, as a result, no additional copyright damages would be rewarded. This recent win is one of many for Detroit's reigning rap god, who caused a viral moment recently with an irate anti-Trump freestyle and has been rumored to be releasing his ninth studio album before the year is up.